"Caroline Picard, a Chicago-based curator who incorporated work by Kendler into a recent show at Gallery 400, "Ghost Nature," brings up the example of research that's been done on the forests around Chernobyl, which are at once vibrant with nature—in the sense that they've been relatively unmolested, inside a thousand-square-mile no-man's-land, since the nuclear disaster—and unnatural, in the sense that radiation poisoning still heavily affects animal and plant life there. A recent study found that even the microbes and fungi that drive decomposition had been altered by radiation. "Personally, I am interested in thinking about that tension—the tension between mourning for an environment we used to consider stable and fixed, and the world we are waking up to—full of uncertainty and change," Picard says. Kendler "doesn't shy away from that tension," she continues. 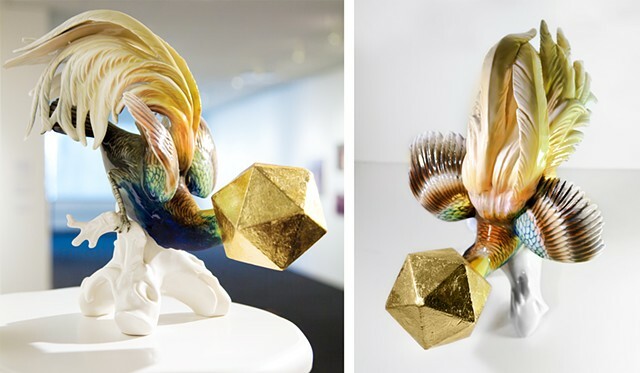 "Many of her sculptural and installation works feel on the one hand like homages to popular conceptions of animals"—the porcelain birds, for instance—"and yet at the same time become really elegant monsters."" - Sam Worley for The Chicago Reader in "The Natural Selection of Jenny Kendler"